The Columbia River Gorge can be explored from either the Washington or the Oregon side. Each side of the river offers unique experiences, views, and hikes in the beautiful Pacific Northwest scenery. In April 2018, my husband and I drove along the Gorge on the Oregon side as a day trip from Portland. If you did not hear about the devastating fire in 2017 that ravaged this area, you may be unaware that a lot of the scenic hikes and drives along the Gorge are closed until further notice. For example, the Historic Columbia Highway offered a slower, more scenic way to travel from one waterfall or hike to the next. After the fire, most of this roadway is closed. The views once available at the famous Multnomah Falls have also been altered, though luckily still breathtaking, until trails can be restored. If you’re visiting this picturesque part of Oregon, here’s where you can explore and what you can expect post 2017 Eagle Creek Wildfire. The best way to reach the Falls from Portland is to take I-84 all the way as the Historic Columbia River Highway is still closed (as of April 2018). You may be surprised to find out that the waterfall can be seen from the highway! There is a parking lot on the opposite side of the highway and you walk underneath the road to reach the recreation area. The Lodge is also next to the falls and faces the highway. For some reason I imagined all of this to be tucked away inside the mountains, requiring a short hike to see everything. Nope. Which means it can be a quick stop before seeing more waterfalls! Multnomah Falls should be your first stop! If you don’t want to fight crowds of people for a photo, show up before 10 am! Maybe arrive earlier if you’re visiting on a weekend. We did our day trip along the Columbia River Gorge on a weekday and started with Multnomah Falls. We got there before 10 am and there were already maybe 20 other people there. That may not sound too bad, but due to the fires damaging the trails and integrity of the surrounding soil, only 1 of the 3 viewing platforms was open. After we took our photos we got some hot cocoa at the lodge. By the time we were done, there were roughly 50 people on the small platform. You’ll notice that there are no people on the Benson Bridge in any of my photos. This was one plus side to the trails being closed. No one could access the bridge. Photo Tip: If using a DLSR, bring a tripod and a neutral density filter to get smooth, silky water. When you arrive early in the morning the sun is still behind the mountain. This means you’re already going to need a slow shutter speed. That tripod will help! I used a Joby Gorilla Pod. Not only is it great for travel because its small, but I could wrap it around the railing and ensure nothing obscured my photo! Also, if you do not have a shutter release control, set your timer to 2 seconds to help reduce camera shake! 1. 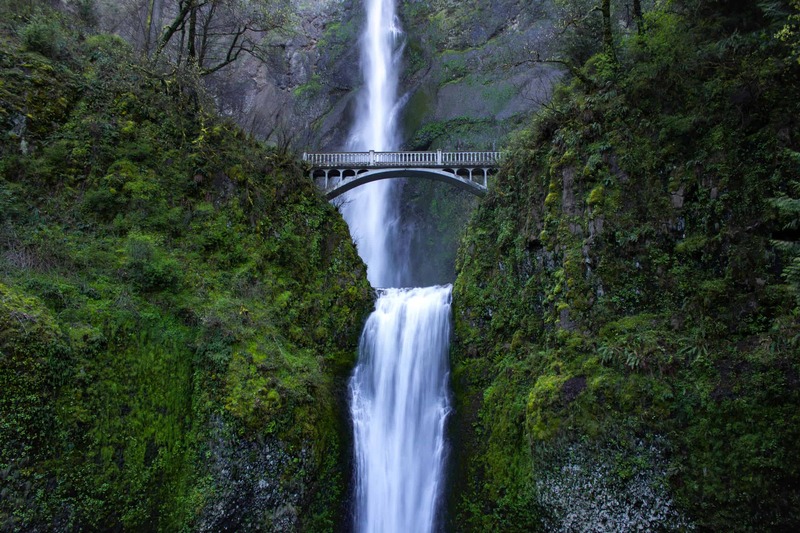 Multnomah is the tallest waterfall in the state at 621 feet. Second tallest in the nation. 2. The Upper Falls are 542 feet tall. The Lower Falls are 69 feet tall. 4. The Falls was once on private land. Simon Benson, a lumber baron and philanthropist, donated the land and funded the building of the Benson Bridge in 1914. 5. Multnomah Lodge was built in 1925 and its construction was funded by the City of Portland. The Historic Lodge is now home to a gift shop, visitor’s center, and restaurant. There are also restrooms. If you need a caffeine fix before the restaurant opens, there is an espresso cart outside in front of the lodge. Be sure to stop inside the Visitor’s Center for details on what trails are open when you visit. At 10 am on a weekday in April, reservations were not required. The restaurant was still mostly empty. But, if you’re visiting during high season and have a large group, I recommend making a reservation. It’s extremely cozy inside and I imagine its even more so in the winter with its fireplace and glass wall facing the falls. In April 2018, the Historic Columbia River Highway between Multnomah Falls and Bridal Veil was closed. To reach Bridal Veil, we had to take I-84 back towards Portland, turn around at the exit for Rooster State Park, and then take exit #28. If the Historic Highway is open when you visit, I recommend taking that route instead. There is a restroom, trail map, and a place to wipe off your shoes (to keep pollen and seeds from spreading) at the parking lot. At only one-mile round trip, the lower trail to the Bridal Veil Falls is very family and dog friendly. (Watch out for poison oak!) Its an easy, well-manicured hike with a big reward at the end! Even if there had been more trails open during our visit, I would have been happy this one was on our list of waterfalls to see. You can either walk along the creek below the falls, carefully climb the large boulder at the base of the falls, or take in the view from a platform. Either way, its hard not to stand in awe of this 120′ tall waterfall. Note: If you want to stay the night along the Columbia River Gorge, look into the Bed & Breakfast at Bridal Veil Falls. Though we didn’t stay here, a friend of mine recently did for a wedding, so it must be nice. Latourrel Falls are actually two waterfalls. The Lower Falls are only a short walk away from the parking lot. To see the Upper Falls, visitors have to hike roughly 1.2 miles uphill. The entire loop is 2.4 miles and crosses the Latourell Creek. Choose which trail is best for you, your family, and your itinerary. Or do both! The Lower Latourell Falls are 250 feet tall and powerful. Like Multnomah, its easy to reach (especially if you’re able to park in the adjacent parking lot). This waterfall, however, lets you get up close. Close enough to get sprayed and nearly blown away. Hold on to your hats and protect that camera gear! Or, if you’re visiting during the summer, welcome it with open arms! The path to the lower falls is along a paved road. There is a bridge at the end, which crosses the creek, allowing visitors to return to the parking lot on the other side. We turned around and followed the path back the way we came instead. For reference, above is a photo of the trail map which can be found at the trail-head. The Upper Falls are not in the photo, but you can get a good idea of the trail for both Upper and Lower Falls. The Upper Falls are not as tall as its lower counterpart, but its impressive. The amount of water rushing down the mountain is amazing. It was difficult to pass without getting sprayed with mist. I also had to shield my camera lens from the amount of water blowing towards us. The 2 mile hike to see these fall is well worth it. In the beginning the trail is steep and has a lot of switchbacks. In fact, the first stretch from the parking lot has a railing because its so steep. There is plenty of tree coverage though so it never felt too hot or strenuous. Be sure to look to your left as you ascend to catch glimpses of the Lower Falls. Once you reach the waterfall, the trail leads you further up the mountain. During spring the trail will be spotted with wildflowers amidst the lush green plants bordering the trail. Some of the trail will be muddy from snow melt trickling down the mountain, too. Near the end of the trail is a spot where you can rest and take in the views of the gorge. Note about trail: At the end of the loop, when you reach the Historic Columbia River Highway, turn right towards the bridge. If you continue straight down a path you will enter private property. See the trail map above for reference. The pictures below are what the end of the trail looks like. You’ll pass by a plaque dedicated to Guy W. Talbot who donated the Latourell Falls and surrounding land to the state of Oregon in 1914 and 1929. The land is now the Guy W. Talbot State Park. Another beautiful waterfall that used to sit on private land. Can you imagine owning property with these gems on them? Tip: Regardless of which fall you choose to see, be prepared to get wet when passing these powerful falls! Protect your camera gear (bring a protective filter for your DSLR lens and some cloths!) and try not to be blown over while crossing the bridges. Also, we saw people climbing on the rocks behind the falls, but I won’t recommend this because it looked extremely slippery and steep. Lastly, always bring water when hiking! Website: http://www.vistahouse.com/; for more info about the Crown Point Scenic Cooridor, click here. This historic rest stop transports visitors back to a time when Americans were in love with driving the open road. I wish all rest stops were this beautiful. It was Samuel Lancaster’s vision in 1913 to make the Columbia River Gorge accessible to tourists, memorialize the hardships of those who first settled in Oregon, and for people to view the Gorge “in silent communion with the infinite.” Sitting at 733 feet above the Gorge its definitely awe inspiring. The Vista House was our last stop on our Columbia River Gorge road trip. Unfortunately, when we visited the winds were so strong that the Vista House was closed. I suppose its dangerous to open and close the doors in windy conditions? But, despite not being able to go inside, we enjoyed the breathtaking views of the river below. Also, living in Texas its always an interesting experience to be able to stand in one state and be able to look across a border into another state. Tip: If you want a photo of the Vista House from afar, stop at the Portland Women’s Forum State Scenic Viewpoint and bring a zoom lens. Located down the Historic Columbia River Highway (39210 Historic Columbia River Hwy) you can stop here on your way back to Portland. The Vista House and Women’s Forum would also be great spots for watching sunset! Have you visited the Columbia River Gorge? What trails do you recommend visiting once the area is restored?